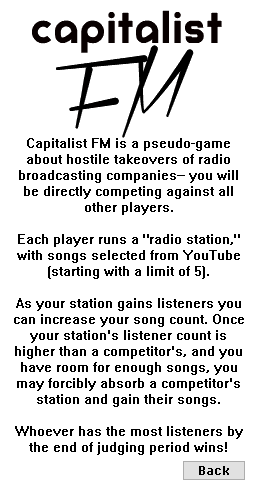 Capitalist FM was my entry for Ludum Dare 34. I think Duran was busy on the weekend so I decided to give another stab at an online multiplayer social experiment, this time even more abstracted away from the concept of a "game." 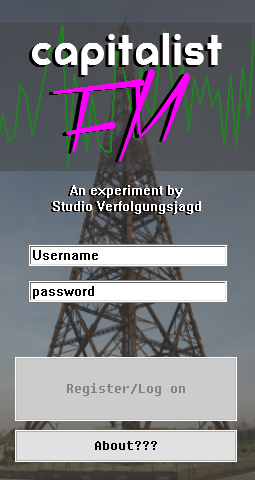 The core gameplay revolves around creating your own internet radio station, with songs pulled from YouTube. The game shows you every other player's station and you are encouraged to give them a listen-- the more listeners your station has, the more songs you're allowed to put on your roster. The catch is that only one player can "own" a certain song at once, and nobody else is allowed to have it on their station. 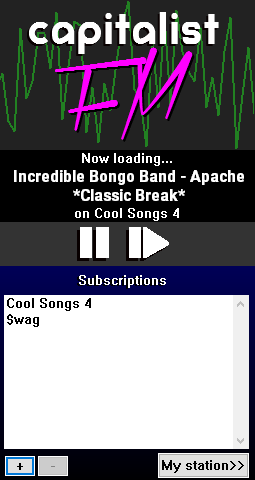 Once you hit a certain listener threshold and you're bigger than another station, you can forcibly take them over and absorb their song roster into your own. The idea here is that it's Agar mashed up with Pandora. I actually still think this idea is cool as hell and I want to remake it as a web-based game. Unfortunately the server was that same damned ThinkPad from CoinSlot and the entire service crumpled once anyone tried to do anything. For a few days though it was cool and there were maybe 10 or 11 running radio stations before I just gave up and shut the whole thing down. When will I ever learn.